Cufflinks for your organisation. In-House Design & Production. 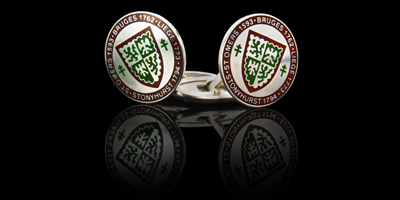 Cufflinks are a worthy gift to someone important to you, bespoke cufflinks are designed exclusively for your organisation. Using a logo on the custom made cufflinks is optional, more and more corporations forgo the logo, instead the cufflinks are designed to tell a story of the company or to show the companies area of expertise. The highest quality jewellery enamel (vitreous enamel) can be used in the design of the enamel cufflinks together with precious metals, normally sterling silver or gold, to give the cufflinks extra value.